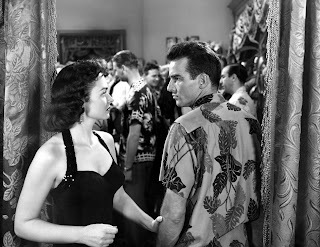 The lives and loves of soldiers stationed at Pear Harbour in the months leading up to the Japanese attack, From Here To Eternity is a rather turgid examination of sordid behaviour, rescued by memorable characters and copious emotions. With World War Two rumbling in the headlines, Captain Dana Holmes (Philip Ober) is nominally in charge of Schofield Barracks in Hawaii. Holmes is an ineffective leader much more interested in recruiting members to his unit's boxing team rather than ensuring good morale and readiness. He is also a rampant womaniser, altogether neglecting his wife Karen (Deborah Kerr). Sergeant Milton Warden (Burt Lancaster) is Holmes' second in command, and in the leadership vacuum does his best to keep the affairs of the barracks in order. Finally disgusted with Holmes, Warden starts a dangerously illicit affair with Karen. Meanwhile, Private Robert E. Lee Prewitt (Montgomery Clift), a single-minded and determined bugler, transfers into the unit, and is immediately pressured by Holmes to join the boxing team. Prewitt refuses, having once badly hurt a man in a bout. With Holmes' tacit approval, Prewitt becomes a target for daily wretched treatment. One of the few men to befriend Prewitt is Private Angelo Maggio (Frank Sinatra), a scrappy and resourceful Italian-American who runs afoul of the burly James "Fatso" Judson (Ernest Borgnine), a boorish Sergeant of the Guard at the stockade. Prewitt takes his undeserved punishment without complaint and manages to start a steamy relationship with Lorene Burke (Donna Reed), a "hostess" at the local entertainment club. With discipline disintegrating among the men as personal vendettas and affairs of the heart dominate their lives, the Japanese attack arrives as a monumental surprise. Based on the James Jones novel inspired by his actual experiences, From Here To Eternity is a prototype of the hormone-drenched television soaps that would take over the world of entertainment in another few years. Viewed in the most crass terms, the film is about rather dim-witted characters behaving badly, soldiers of every rank with little to do except find useless trouble with women, trouble with the bottle, and trouble with each other. But in spite of itself, From Here To Eternity registers an impact thanks to three sharply drawn characters. Sergeant Warden, Private Prewitt and Private Maggio are likable because they are real, flawed, stubborn, and frustratingly unable to avoid life's pitfalls. These men would not be peace time soldiers if they were really good at anything else, and the film mercifully avoids turning them into unrealistic principled heroes. Instead, Warden succumbs to his lust and embarks on an affair that has "career-ending move" written all over it, Prewitt ignores the clear wishes of Holmes and subjects himself to a life of humiliation, adding to his agony by getting entangled with Lorene (a prostitute in the novel converted to a hostess to satisfy the movie sensibilities of the day), and Maggio has the courage to take on Fatso but not the brains to realize that the outcome is unlikely to be in his favour. All three are dim, yes, but also refreshingly authentic, unsophisticated men proving why they ended up in the army. Using sparkling black and white, director Fred Zinnemann conjures up some high-impact scenes, most famous being Warden and Karen cavorting on the beach with the foamy surf washing away any sense of guilt. More emotionally intense are Warden and Prewitt having a drunken conversation in the middle of a dirt road, both of their lives reduced to pathetic lamentations, and Prewitt tearfully playing taps to honour a fallen colleague. Montgomery Clift does emerge with the most fervent performance, creating in Private Prewitt an intractable man who does not mind being externally kicked around as long as he is comfortable with his internal code of conduct. 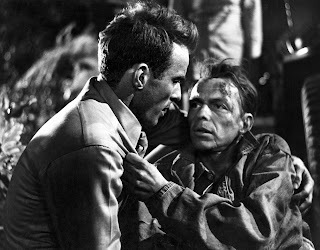 Clift conveys a dark brew of seething anger kept in check by remarkable conviction. Frank Sinatra is also excellent in a role he lobbied heavily for, Maggio dominating every scene he is in with an attitude of battling good humour, intent on making the best out of life's limited opportunities. In contrast with both Clift and Sinatra, the sturdy Lancaster plays the sturdy Lancaster, exactly what is expected of him. Deborah Kerr steps way outside of her zone of comfort to play a woman leaving a trail of broken toyboy soldiers in her wake, while Donna Reed as the warmer, more intimate Lorene is also memorable as the unexpected soul mate for the brooding Prewitt. From Here To Eternity dominated the Academy Awards, receiving 13 nominations and winning 8, including Best Picture, Best Director, Best Screenplay and both Supporting Actor awards for Sinatra and Reed. Warden, Prewitt and Maggio may not represent exemplary behaviour, but sometimes glory can be found in celebrating the foibles of normal men. Deborah on the beach at Hawaii ! gathering it, in a lovely knot of curls again..."